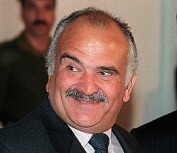 f the Prophet Mohammed (pbuh) would have to choose a companion and a friend in the modern day, one of his choices may be His Royal Highness Prince El Hassan bin Talal. Not only is he himself a descendant in the forty-second generation of the Prophet, but he is a man of wisdom, humor and a golden heart. Visiting him in his small but so charming palace in Amman, you meet a man who not only cares for his family with extraordinary Princess Sarvath, three dauthers, a son and six gradchilrden, but also holds the rare 8th Dan Black belt in the martial art of Tae kwan Do, once captained the royal Jordan Polo team and is also a helicopter pilot. Much more than this, he is the main motor on the journey back to the roots of the Prophet and his dominant teaching of respect and tolerance toards other religions. The Prince of Widom founded the Royal Institute for Inter-Faith studies in 1994 and the International Foundation for Interreligious and Intercultural Research and Dialogue in 1999. Highly decorated for networking a peaceful world of respect, he is one of the Champions of Tolerance. More background information can be found here.